The carbonized wood is usually called anti-corruption wood since it will not be corrupt after the 200 degrees' carbonized procurement. This procurement makes the stool very durable in high temperature and water. So this material can be used for the swimming pool resting stool etc. This stool is a free assembly one. WARM TIPS: PLEASE NOTE THE SIZE ADN CHECK IT, IT IS SMALL STOOL ! 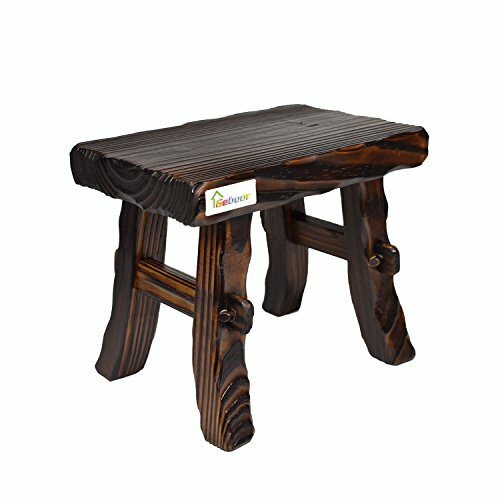 The square stool is made of carbonized wood, which is anti-corrupt. The step stool has a special traditional outlook in dark brown.Perfect for kids. Light coating on the surface makes it waterproof and can be used in bathroom after being carbonized. Can be used in high temperature for example outdoor swimming pool resting stool after being carbonized. Size:11.02*7.09*9.06inch.Please note the size and check it,it is a small stool.